Gala Concert 2006 - Let the Campus Sing! In 2005, the University celebrated its 40th Anniversary in style with a huge free open-air concert, complete with over 3 hours of live entertainment, bar, barbecue and, of course, fireworks. In 2006, the Gala Concert returned, bigger, better and with even more crammed into over three hours of live entertainment from some of the University's finest musicians. One of the most impressive events ever staged by the Music Centre, last year’s Gala Concert attracted an audience of approximately 6000 students, staff, graduates & members of the local community and this success was repeated this year. The Concert provided music to suit all tastes, from opera to jazz, with performances by the University Big Band, Wind Orchestra, Brass Band, Symphony Orchestra, Music Theatre Warwick & Chamber Choir, with a massed finale of popular sing-along tunes. 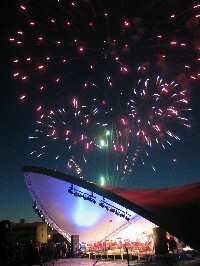 With a bar, barbecue and fireworks to finish, the 2006 Gala Concert provided a fabulous way to end the University year and start the summer off with a bang! The 40th Anniversary Gala Concert in 2005.